This is a perfect example of a local style dish that has become popular at fancy restaurants. 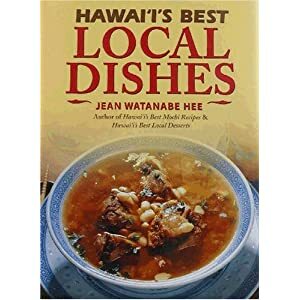 Order Hawaii's Best Local Dishes Cookbook - Pork Adobo, Oxtail Soup, and Honey Glazed Walnut Shrimp to Lazy Style Laulau, Portuguese Bean Soup, and the island style Loco Moco. These are the recipes passed on from friends, coworkers, and relatives; the local favorites that are found at potlucks and beach barbecues through the Islands. In a saute pan over medium heat, melt the butter. Add the garlic and saute for 2 minutes, stirring occasionally. Add the mushrooms and saute for 2 minutes longer. In a saucepan of boiling salted water, blanch the spinach for 30 seconds. Transfer the spinach to an ice bath to cool. Drain and gently squeeze out any excess moisture. Place clams, Kalua Pig, mushrooms, spinach and tomatoes in a large pot. Add chicken stock. Cover pot tightly with lid. Steam until clams open. Serve in a bowl.